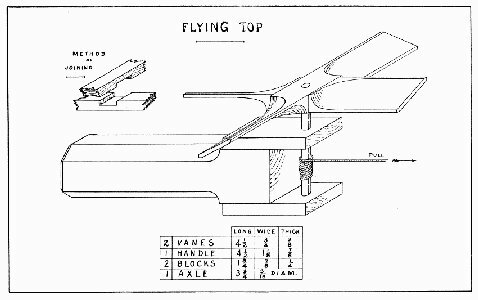 This form of flying top requires accurate work to make a good joint. 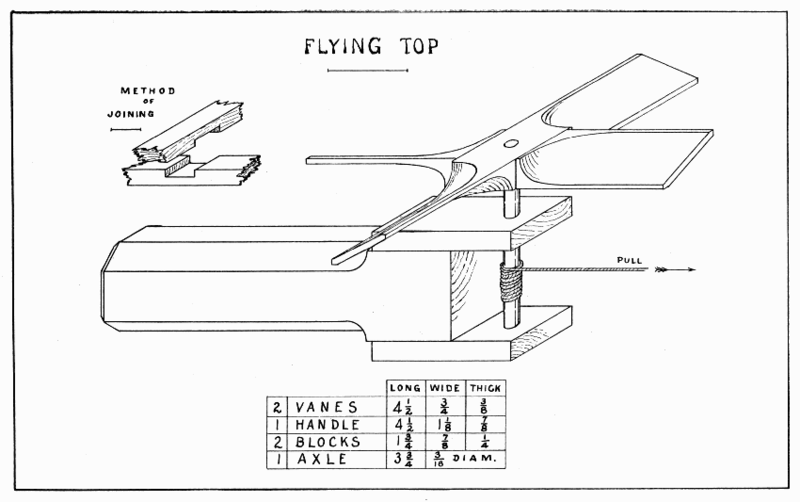 After planing the two vanes to size, the joint must be laid out with knife and gage lines and cut out with back-saw and chisel. Two important facts should be learned: The length of one notch equals the width of the other piece; the lines marking the depth of the notches must be gaged from the working-face of each piece. After the joint is laid out, hold the work in the bench-hook while sawing the depth of the notch, and be sure to saw in the notch, not outside the line. With a chisel held flat side down, pare between the saw cuts from each side of the wood towards the middle. When the joint is fitted, lay out the curves on each arm of the wheel, remembering that it is always the front corner of the right-hand arm, as the wheel turns around, that is to be whittled away. When all these curves are drawn, take the joint apart, and whittle to the lines. Glue the joint next, and bore a 3/16" hole straight thru its center. Make the axle of hard wood. Perhaps a skewer can be used. After the handle is planed to size, draw pencil lines 1/4" from each edge for the chamfers. The curve of the chamfer may be drawn freehand. It should end 1-1/16" from one end of the handle. A good chamfer is flat crosswise. If the grain of the wood is straight, the chamfers can be whittled easily; if it is crooked watch that it does not split over the line. After the chamfers are made, pare another one 1/8" wide around the end of the handle. After the two blocks are planed, bore a 1/4" hole 3/8" from one end. Glue and nail them 1" on the handle.